Koronadal City—The Department of Social Welfare and Development in SOCCSKSARGEN has completed some P209 million worth of community projects through one of its flagship poverty-reduction programs, Kalahi-CIDSS, an agency official said Tuesday. Bai Zorahayda T. Taha, DSWD 12 regional director said that the amount represents a total of 134 projects that were completed through the assistance from World Bank, with community and local government counterparts. Among the projects are school buildings, health stations, roads, electrification, flood control, water systems, bridges, post-harvest facilities and many others, benefiting thousands of villagers, especially in the far-flung areas of the region, Taha said. “These projects were implemented through a strategy that encourages volunteerism in which communities are empowered to identify their pressing needs,” Taha explained. The different projects are located in towns of Bagumbayan, Isulan, Kalamansig, Lambayong, Lebak, Lutayan, Palimbang and Senator Ninoy Aquino in Sultan Kudarat; Glan, Kiamba, Maasim, and Maitum in Sarangani province; Alamada, Aleosan, Banisilan, Carmen and Pikit in North Cotabato. “Local communities in these different towns were also trained to craft their propose projects, present to municipal inter-barangay forum for funding, then manage and sustain it,” Taha said. Taha added that the funds for projects were directly downloaded to the accounts, managed and controlled by chosen volunteers by the community. “The agency is expecting to complete at least 50 more projects in the coming months,” Taha said. With the bottom-up development approach, Kalahi-CIDSS, which stands for Kapit-Bisig Laban Sa Kahirapan-A Comprehensive and Integrated Delivery of Social Services, was chosen as one of the awardees of the U.S. Treasury’s second annual Development Impact Honors Awards in 2013. A volunteer working for CCT program teaches T’boli native women regarding basic education in Lake Sebu town in South Cotabato. The Department of Social Welfare and Development (DSWD) launched the updated database of poor households in the country through the Listahanan or NHTS-PR. In preparation, the department reviewed the methodologies associated with the Proxy Means Test (PMT) models used in the targeting process, particularly to find alternative (additional) variables that are beneficial in identifying the poor and non-poor households. A total of 5,116,976 were identified poor households out of the 15,128,643 households assessed nationwide. Urban areas got a percentage share of 23.4% or 1,195,073 identified poor households while rural areas got a percentage share of 76.6% or 3,921,903 identified poor households. This translates to 14% decrease in poverty rate as compared to the results of the first assessment in the year 2009. Consistently, the national launching of the Listahanan database strengthens the active partnership between the department and its stakeholders such us the World Bank and other national government agencies. In Region XII with a nationwide share of 7.0 percentage or 358,132 poor households were identified poor out of 800,653 assessed households while ARMM with a nationwide share of 11.2 percentage or 573,446 poor households were identified poor out of 925,957 assessed households. The Field Office XII shall conduct the Regional Launching of the database for SOCCSKSARGEN and ARMM after the 2016 elections. The PMT model is a statistical method used to predict the per capita income of a household based on observable characteristics that determines the per capita income of the household. In lieu of the household’s actual per capita income, its predicted per capita income from the PMT model is used and compare with the official poverty threshold generated by the Philippine Statistics Authority (PSA). The household is classified as POOR when the predicted per capita income from the PMT model is less than the official poverty threshold, otherwise, the household is classified as NON-POOR. A total of 139 variables are identified as potential explanatory variables for the household’s per capita income; 45 variables are from the FIES, 53 variables from the LFS and 41 variables from the CPH. Bai Zorahayda Tanggol Taha said that local government units, national government agencies, non-government organizations are encouraged to utilize the updated database in identifying poor households who shall be recipients of their social protection programs and enter into memorandum of agreement with the department to access that list of poor household. Data sets shall be turned-over once the MOA is signed by the DSWD Secretary. Some areas in SOCCSKSARGEN have been experiencing drought due to the El Niño phenomenon. Usec. Vilama B. Cabrera and Dir. Bai Zorahayda T. Taha, Regional Director of DSWD XII attended the Committee on Justice and Human Rights to talk about the Kidapawan incident. Senator Allan Peter Cayetano complimented DSWD Field Office for using their QRF – Quick Response Fund in responding to the Kidapawan incident. Usec. Cabrera informed the committee that there are 93 injured PNP: 3 female and 90 male, 48 injured rallyists; 19 female, 25 male and 4 older persons, and 82 emotionally distressed and rescued. Also, Cabrera confirmed that from the rallyists, there are 3 pregnant women and 3 senoir citizens, and 2 were confirmed dead in the incident namely: Enrico Fabligan of President Roxas, North Cotabato and Darwin Sulang of Arakan, North Cotabato. “Since October 2015, the DSWD has released a total amount of Php 599,919,584.00 worth of assistance to Local Government Units for the affected families,” Secretary Corazon Juliano-Soliman explained. The distribution of food assistance shall be released in coordination with the Provincial/City/Municipal Social Welfare Development Office (P/C/MSWDO) of each area. A total of 65,798 family food packs were provided to the El Niño affected families amounting to Php 23,687,280.00. Out of this, 20,495 food packs for South Cotabato, 40,728 food packs for North Cotabato, and 4,575 food packs for Sultan Kudarat. Field Office XII remains in close coordination with the P/C/MSWDO of SOCCSKSARGEN for the immediate release of rice allocation per LGU. As of March 22, 2016, a total of Php127,920,450.00 worth of assistance or 63,015 beneficiaries for Region XII were granted with Php 2,030.00 for 10 days at Php 203.00 per day which is for the implementation of Cash-for-Work under the Climate Change Adaptation and Mitigation (CCAM). Of the total amount provided, South Cotabato with Php 27,976,310.00 for 13,777 beneficiaries in 11 LGUs, North Cotabato with Php 50,252,650.00 for 24,755 beneficiaries in 18 LGUs, Sultan Kudarat with Php 31,641,610.00 for 15,587 beneficiaries in 12 LGUs, and City of Cotabato and General Santos with Php 18,058,880.00 for 8,896 beneficiaries in 2 cities. The province of North Cotabato, Sultan Kudarat and the city of Cotabato and General Santos have fully accomplished their Cash for Work activities with 100% while the province of South Cotabato has finished 99.98% of their activities. To date, 63,015 beneficiaries with 99.99% out of the total target of 63,018 beneficiaries have been served. DSWD Region XII has also extended a total 2,645,000.00 worth of assistance to Kidapawan Incident. The said total amount is composed of 6,000 family food packs that were released directly to the beneficiaries in coordination with the CSWDO of Kidapawan, 500 family food packs were distributed by Ms. Rosemarie C. Alcebar, SWAD Team Leader together with the Municipal and Provincial Links of North Cotabato, and 1,000 hygiene kits were released directly to the beneficiaries in coordination with the CSWDO of Kidapawan. Likewise, DSWD Field Office XII also provided financial aid to 175 individuals in North Cotabato amounting to Php 347,000.00. Director Taha said that “families of the confirmed dead were given Php 5,000.00 each, 85 injured individuals were given Php 3,000.00 each, and 82 distressed and rescued individuals were given Php 1,000.00 each. Ms. Norhata C. Benito, Head of Risk Reduction and Management Section, said that DSWD Field Office XII has initially allocated 55,000 bags of rice for the El Niño affected families in Region XII and ARMM – Lanao and Maguindanao. Of the total bags of rice, 10,000 bags of rice each for North Catabato, South Cotabato, Maguindanao and Lanao del Sur, and 5,000 bags of rice each for General Santos City, Sarangani, and Sultan Kudarat. Ms. Benito added that the distribution shall be 5 kilos of rice per family multiplied by the total number of affected families. Ms. Benito added that the region has a preposition stockpile of 30,000 family food packs and 3 million standby funds and is available at any given time. MAITUM, Sarangani—T’boli children of Kalaneg village have now another reason of going to school comes class opening this June. 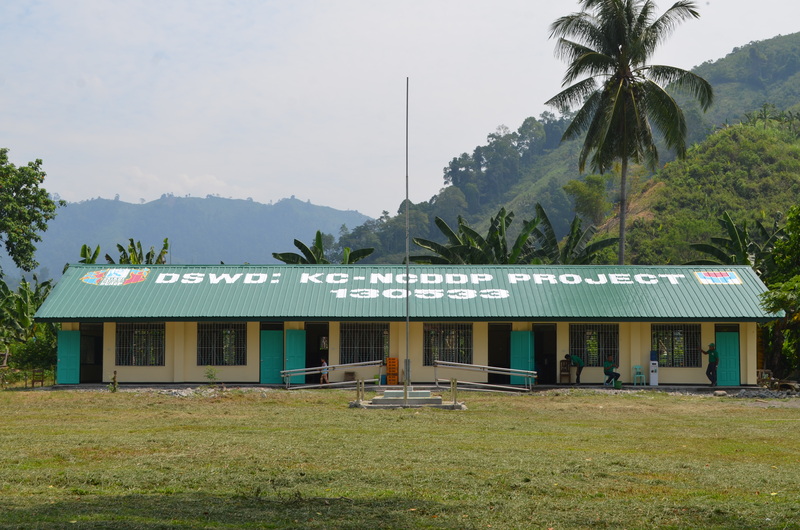 A newly-completed school building is awaiting pupils of Lomutan Elementary School after Department of Social Welfare and Development has turned over it to the community recently. Bai Zorahayda T. Taha, DSWD-12 regional director said on Tuesday that the school building project is an answer to the education pressing need of the community, which old and dilapidated classrooms are found to be unsafe for children, majority from T’boli tribe. “The new classrooms will surely make a difference in the learning process of children,” Taha said in a statement. Taha added that the three-classroom project in Kalaneg is worth P2.66 million with the financial support from World Bank and constructed through the agency’s community-driven development (CDD) program, Kalahi-CIDSS. Kalaneg’s school building is one of the 190 various community projects carried out under Kalahi-CIDSS in Region 12 after being scaled up as a national strategy for poverty-reduction, Taha said. Prior to its completion, high ranking World Bank officials paid a visit in the community as part of the 4th Kalahi-CIDSS implementation support mission in the country, looking into the progress of its implementation. The community was recognized, headed by Barangay Captain Gary Lee Perrett, for providing vehicle for free to fetch school children from their homes to school and vice versa, starting last year. “Aside from the condition of our classrooms, distance is one of the major factors of the decreasing number of enrollment year after year,” Perrett said. According to Perrett, many school children used to cut their classes in the afternoon and started to hike back to their homes. With the new classrooms and free transportation, Perrett added that it will be of great help in encouraging the villagers to bring their children back to school. Meanwhile, Tyron Jann Villanueva, area coordinator in Maitum said that the town is completing a total P14.49 million various projects including schools, health stations and a bridge. Under the program, according to Villanueva, the town is now implementing the “Makamasang Tugon” phase, an LGU-led implementation designed to sustain the gains and lessons learned in the implementation of Kalahi-CIDSS by adopting the CDD as a strategy. Kalahi-CIDSS, which stands for Kapit-Bisig Laban sa Kahirapan-A Comprehensive and Integrated Delivery of Social Services, is one of the three core programs of DSWD. In this picture shows parent leaders under Conditional Cash Transfer program attend their weekly meeting in the village of Ned, T’boli, South Cotabato. Around 7.7 million Filipinos, or some 1.55 million families, have been lifted out of poverty due to the Conditional Cash Transfer program. TANTANGAN, South Cotabato – A grade 8 honor student from this town has one request for President Benigno Aquino – to institutionalize the conditional cash transfer program before the end his term. Armelyn Lozada, Grade 8 student of Tantangan National High School. 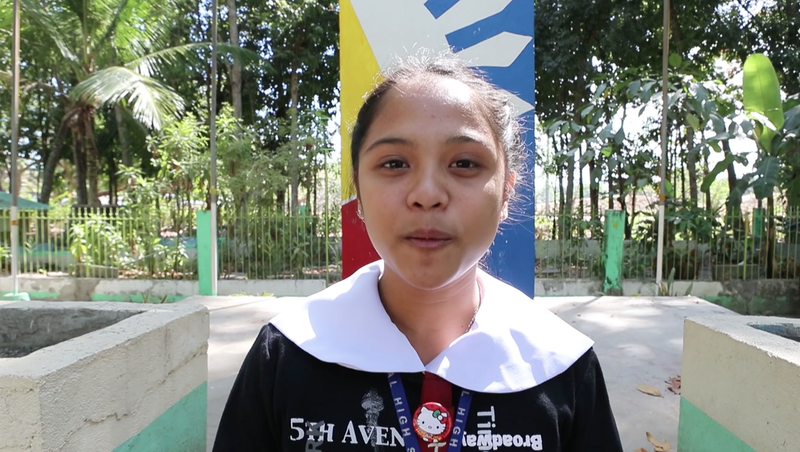 Armelyn Lozada of Tantangan National High School, said that passing a law for CCT will help students like her to push their dreams to get a degree in college. “The grants my parents get from the program were used for my education and some goes to our small store as part of capital,” said Lozada, an honor student since elementary. “I wanted to become a teacher someday and I hope our President will pass the bill for CCT. It would be a big help to us,” Lazada added. Bai Zorahayda Taha, DSWD regional director, said the student’s pronouncement only shows the program is not a dole out. Regional program coordinator Juliet Clavel revealed several students covered by the program have ended their schooling with honors. “Our partners from the civil society organizations are also hoping the administration will pass the CCT bill,” Clavel said. The CCT aims to provide social assistance and development through monetary support to extremely poor families by investing in their health, nutrition and education. KIDAPAWAN City – The Department of Social Welfare and Development XII immediately released through the City Social Welfare Development Office in Kidapawan City at least 6,000 Family Food Packs and 1,000 Hygiene Kits. A staff from DSWD XII Disaster Risk Reduction Management Section is monitoring status of the protesters inside Methodist Compound and closely coordinating with provincial and city social welfare and development officers for technical assistance and resource augmentation.